Press and politics; United States. Broadcast journalism; Political aspects; United States. Mass media; Political aspects; United States. 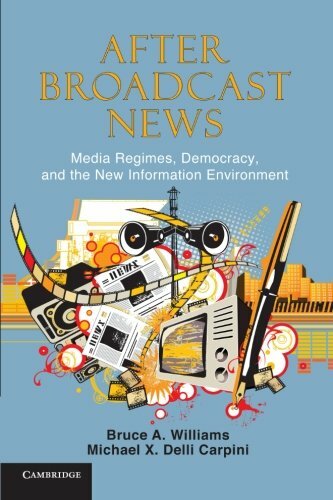 Amazon.com description: Product Description: The new media environment has challenged the role of professional journalists as the primary source of politically relevant information. After Broadcast News puts this challenge into historical context, arguing that it is the latest of several critical moments, driven by economic, political, cultural, and technological changes, in which the relationship among citizens, political elites, and the media has been contested. Out of these past moments, distinct "media regimes" eventually emerged, each with its own seemingly natural rules and norms, and each the result of political struggle with clear winners and losers. The media regime in place for the latter half of the twentieth century has been dismantled, but a new regime has yet to emerge. Assuring this regime is a democratic one requires serious consideration of what was most beneficial and most problematic about past regimes and what is potentially most beneficial and most problematic about today's new information environment. About: The new media environment has challenged the role of professional journalists as the primary source of politically relevant information.